High levels of creatinine and BUN (blood urea nitrogen) in dogs is usually a sign of poor health. Most commonly, these levels are associated with the kidneys and can indicate that your dog is experiencing kidney disease or even kidney failure. Reducing the BUN and creatinine levels in your dog may be possible by trying a few different methods. If from a blood test, your veterinarian finds BUN and creatinine levels in your dog that are out of range, he can discuss proper medications that are needed in order to lower the levels. 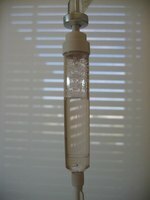 Begin intravenous fluid therapy in your dog. Hydrating your dog with fluids can help to flush out the kidneys. It can also help to replenish him if he has become dehydrated. Administer furosemide or mannitol to your dog if the kidneys aren't able to produce urine. This will also help to flush the kidneys out and lower the creatinine and BUN levels. Feed your dog a diet that is formulated for those with high creatinine and BUN levels. This is typically a high-quality, low-protein and low-phosphorus diet. Eating this type of food may decrease the stress that is put on the kidneys by other foods.